Pristine white lab mice scurry purposefully around a gleaming cage in a lab at Stanford University. 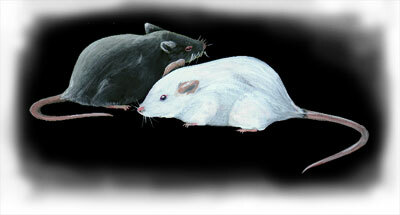 To the human eye, these mice look much the same as any other lab-bred specimens. But when Christopher Contag puts one inside a lightproof box and points a specially designed $110,000 digital camera at it, the computer-generated image on the video screen is decorated with brightly colored patches. The color represents light thats shining through the animals tissue, like a bright lamp shines through your hand. Contag and his collaborators are using twinkling mice to track the progress of diseases like cancer and food poisoning, and to test ways of defeating them. Its far more efficient than the traditional approach, where researchers had to laboriously study the tissue from scores of lab animals under a microscope to figure out what was going on inside them. By lighting up bacteria or cancer cells, they can simply follow the same animals, watching over hours, days, or months as a disease runs its course. Or, they can treat the animals and see the disease being defeated as the glow fades. When it comes to drug trials, these mice save time and money. And its not just rodents that are taking on an unnatural glow. A microbiologist is lighting up beef carcasses to search for bacteria that can cause food poisoning, and to figure out how best to get rid of them. The source of the glow is the same chemical reaction that can make a fireflys belly flicker or light up the dark ocean with thousands of tiny stars. This is bioluminescence, one of natures most impressive light shows. It turns up naturally in all kinds of living thingsbacteria, mushrooms, algae, and fish, to name a few. 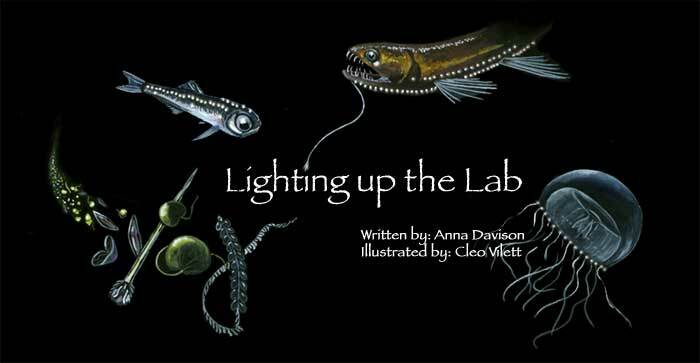 Fireflies use it to pick up partners, shrimp use it to camouflage their silhouettes and shadows, and deep-sea fishes hang bioluminescent lanterns over their mouths to draw in prey. Just a few land-living organisms are blessed with bioluminescence, but in the sea, its everywhere. Scores of creatures glow, pulse, and flicker, fueled by any of a couple dozen different chemical systems. To biologists, this suggests that a host of different organisms acquired their ability to glow independentlyfor one of several good reasons. "Its obvious when you think about it," says James Case, a marine biologist at UC Santa Barbara. "For example, if youre an organism that lives in the upper layer of the ocean, its clever for you to make enough light to obliterate your own shadow." That means that any predator casting an eye upwards in search of dinner wont see their prey clearly silhouetted against the light shining down from above. But camouflage isnt the only reason to turn on a light. 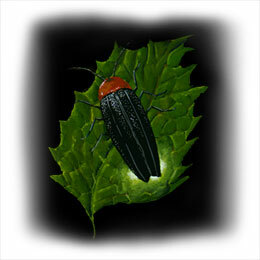 Others use it to flash seductively at potential mates or to snare prey. Some vulnerable ocean dwellers light up when threatened, in the hope that something big will happen by and swallow their attacker. A common North Atlantic shrimp takes a more direct approach. When confronted by an enemy it spews out a glowing cloud of bioluminescent plankton, then takes its chance to flip away from the startled predator. The secret of natures glowing displays is a family of proteins called luciferases, which are found in every bioluminescent organism. These enzymes feed off other energy-rich chemicalstheir substrateto produce the telltale glow. Decades ago, researchers realized that by hooking up the gene for luciferase to other genes in a cell, they could create a handy glowing marker. If they switched on the gene they were interested in, then the luciferase gene would also be spurred into action. Then all they needed to do was feed the luciferase with its chemical substrate, and the cell would glow, proving the genes were active. Now researchers are putting bioluminescent markers to good use in test tubes, flasks, and petri dishes around the world. At a conference six years ago, Christopher Contag heard scientists describe their work with bioluminescently marked bacteria and viruses. As he listened to them talk about the long hours they spent poring over cell suspensions and microscopes, he wondered if there was a better way to spy on an infection. It occurred to Contag that if he could put the glowing pathogens inside a live animal and watch them from the outside, he could see exactly how diseases work, rather than making assumptions based on a collection of cells confined to a test tube or beaker. Contag and his wife Pamela, who also worked with glowing bacteria, set about figuring out exactly how to light up an animal. A bigger challenge was finding a way to pick up the dim light that would shine out of its body. While contemplated the problem, they heard about a colleague at Stanford who was using light to reveal the inner working of animals. Pediatrician and engineer David Benaron was using laser beams and different wavelengths of light to probe their tissue, like a doctor might use a CT (computed tomography) scan. By lighting animals up from the outside, he could examine the structure and chemical composition of their flesh. Intrigued, Christopher Contag contacted Benaron and they decided to try putting the light inside the animals. 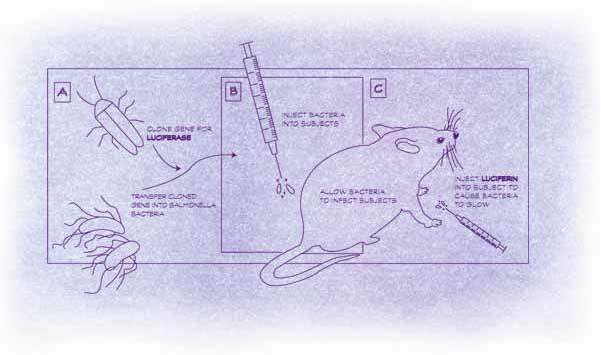 In 1995, the three scientists created their first glowing mice. They took the genes that make some kinds of bacteria glow in the dark, and put them into Salmonella, which can cause severe food poisoning. The bacteria adopted the luciferase genes as if they were their own. When they multiplied, each new cell inherited the glow-in-the-dark genes. Together, the five genes lent the Salmonella an unnatural glow. Once theyd fed the bacteria to mice, they could watch as the glimmering infection spread. After they treated the animals with antibiotics the glow faded. They didnt have to sacrifice scores of mice, isolate the bacteria from their tissues, then spend hours hunched over a microscope counting them. All they had to do was check the animals under the camera every few hours. Contag immediately saw the potential to save time, money, and mice. "You can reduce the number of animals used for experiments tenfold while getting more information more quickly," explains Contag. Stanford University patented the technology. A year later, Christopher and Pamela Contag, together with Benaron, founded a company to develop and market it. These days Xenogen Corporation, based in Palo Alto, California, employs more than 60 people and holds the exclusive license for the digital camera and associated technology used to pick up bioluminescent light emanating from inside mammals. Now dozens of research organizations in the United States and Europe use Xenogens technology. Contag is enjoying the ride. He gets a kick out of the many and varied uses of bioluminescent markers. Hes traced the spread of infection and cancer and watched them retreat, knocked back by antibiotics and chemotherapy drugs. Understandably, drug companies are excited. Animal trials tend to create the biggest hold-up in the process of drug development. Anxious pharmaceutical companies are forced to wait for months as scores of animals are poked and prodded. That bottleneck doesnt help their bottom line. Contags teams twinkling mice promise a way of speeding up the process, not to mention making it more accurate, since researchers can see exactly whats happening in a live animal. It can cost drug companies hundreds of millions of dollars to develop a single, successful drug, but about 90 percent of clinical trials end in failure. Contag says any way of better evaluating a drug before it hits clinical trials is good news. Drug companies arent the only ones eager to light up their labs with incandescent animals. The National Cancer Institute in Bethesda, Maryland, has poured millions of dollars into the field. Its particularly interested in dealing with one of the nightmares of cancerthe kind of disease that lingers menacingly in the body after surviving medicines best attacks. Once treated, a cancer patient might remain in good health for years, but theres always the nagging fear that the disease will return. Even after surgery, chemotherapy, radiation, or a combined arsenal, a smattering of cells can hang around. They might lurk for years, even decades, undetected, only to reassert themselves, sending the patient into a relapse. A lab animal isnt especially useful when it comes to studying this residual disease. And in humans, cancer is hard to find until its organized itself into sizable tumors. Techniques borrowed from molecular biology can be used to amplify the tumor cell DNA, so that its picked up more readily. But thats difficult and expensive. The best conventional techniques, like MRI (magnetic resonance imaging), might pick up a tumor a few millimeters wide, crammed with millions of cells. But by tagging cancer cells with bioluminescent genes, Contag can detect as few as 1,000 cells scattered through the abdominal cavity of a mouse. "Thats greater sensitivity than any other detection system," he says. And if researchers can pick up just a few cancer cells, theyve got a better chance of finding ways to obliterate them. This is one of Contags ongoing projects, working with Robert Negrin, an oncologist at Stanford University. Theyve already proven that twinkling mice have a starring role to play in cancer research. By tagging bioluminescent markers to human cervical carcinoma cells and injecting them into mice, Contag and Negrin were able to scrutinize the disease as it infiltrated the animals bodies. When they added chemotherapy drugs, the light dimmed. Clearly, the drugs were working. But chemicals arent the only things Contag and Negrin are using to fight cancer in lab mice. Negrin has developed a new anticancer therapy that mobilizes the bodys own defenses to battle the disease. The warriors are T cells, the immune systems front-line defenders. Negrins plan is to gather them from humans, nurture them in the lab, then release them into the body to seek and destroy cancer cells. Contag and Negrin tried the technique in mice, letting T cells loose on glowing cancer cells. Sure enough, the animals lost their telltale twinkle. Bolstered by the success, Negrin has moved on to humans, trying out T cells as therapy for lymphoma. He says he hopes to use T cells to mop up the last remnants of cancer left after chemotherapy, or a bone marrow transplant. Contag has a mental list of other diseases hed like to tackle with a little help from glowing lab animals. He thinks bioluminescent markers could come in handy to test gene therapies being developed to treat diseases that result from genetic defects, such as cystic fibrosis. The therapy involves putting healthy genes into patients to replace the abnormal ones, or introducing genes that could be sent to tumor cells to convert an otherwise harmless drug into a cancer killer. "If you deliver that therapeutic gene, you can always link it to luciferase," says Contag. "It will tell you how well you delivered that gene to the target tissue." Thats in the future. At the moment Contag and his colleagues have their hands full with all kinds of illuminating projects. As word of this ingenious work has spread, researchers from all over the country have contacted them, wanting to put light-producing markers to work in their own studies. Everyone from medical researchers to microbiologists has been knocking on their doors. One of those would-be collaborators is microbiologist Gregory Siragusa, formerly of the USDAs Meat Animal Research Center in Clay Center, Nebraska. Siragusa studies meat contamination. In particular, hes interested in how bacteria cling to different parts of a carcass; whether they stick more tenaciously to fat or muscle. Traditionally, he would have studied patterns of bacterial contamination by laboriously taking tissue samples from dozens of carcasses. But when Siragusa heard about Contags work, he was excited. Rather than fiddling in the lab, he could just daub carcasses with glowing bacteria, then pick up the lingering bacteria with Contags digital camera. So Siragusa showed up at Contags lab with everything he needed for the study. "He shipped all the stuff from the USDAall the meat and the manure, everything," remembers Contag. Siragusa wanted the manure so he could make the experiment as realistic as possible. He used it to mix up a smelly slurry, like what you might wade through on the floor of a meat processing plant. The secret ingredient was bioluminescently marked Escherichia coli bacteria, a common culprit in food poisoning. After smearing the bacterial cocktail on the carcasses, Siragusa used Contags digital camera to detect the light from bacteria sitting on the meat surface. The technique was surprisingly effective, picking up as few as 50 bacteria lurking on a carcass. "I was flabbergasted at the sensitivity," says Siragusa. Most importantly, the glowing bacteria showed Siragusa exactly where the bacteria were positioning themselves on the carcass, rather than having to extrapolate from the bacteria counts in a host of tissue samples. "It was like a eureka moment," enthuses Siragusa. "This gives us so much more information." He could see that more bacteria stuck to surface muscle than fat. Now Siragusa is studying exactly how the bacteria cling to the meat surface, so that he can figure out how best to get them off. He plans to use glowing bacteria to size up the decontamination techniques used to clean carcasses in meat-processing plants. Siragusa sees a host of possible applications for Contags twinkling bacteria. "It amazes me that the research hasnt taken off more than it has," he laments. But the potential novelty value of the technology certainly hasnt gone unnoticed. Would-be entrepreneurs have used bioluminescent markers in a rather creative fashion, to light up everything from soft drinks to snacks. Contag says hes had people call and ask him to create glow-in-the-dark fish to add extra sparkle to their aquariums. "Id never do that," he says. "But if someone else wanted to, Id buy them for my kids." For now, Contag and his colleagues are happy just to use their glowing cells to shed some new light on old research problems. B.S., Biology & Marine Biology, Western Washington University, Bellingham, Wash.